Although the title suggests this is just a review of Atonement (and is biased towards it), this is really a review of the three Voyager novels The Protectors, Acts of Contrition and Atonement which essentially make up a single story. As a warning, this book (and by extension this review) contains heavy spoilers for the Destiny series, and the earlier Voyager relaunch stories (Full Circle to Eternal Tide). Voyager and its crew and allies face some of the consequences of their first trip through the delta quadrant, while Seven of Nine struggles with the changing attitudes of the Federation following the events of Destiny. One of the reasons I like Star Trek now is the sheer wealth of material available. The novels have been going from strength to strength, expanding the material in ways that would not have been possible while the show was still on TV. Despite this, I was a little concerned when the Voyager relaunch series began in Full Circle and immediately introduced a lot of new characters at once, and did so in a way that suggested they were going to stick around and be important. I think this trilogy has proven the idea was worth it. At its core, there are two stories going on simultaneously, one in the Federation and one with the Full Circle fleet in the delta quadrant. Plot-wise they have nothing to do with each other and could have happily existed in separate works. Despite this, they do work well together solely because of the complicated relationships between all the characters – partly the existing ones between the characters we all know, but also significantly with the new ones introduced. Characters’ actions were frequently motivated by their relationship with those in the ‘other’ story so this structure helped emphasize this in a way that would have been lost had they been separate. The Federation storyline deals with unexpected fallout from the destruction of the Borg. Seven of Nine and Tom Paris leave the Full Circle fleet to help with this in a story centred around the ethics and morality of the Federation trying to rebuild too quickly. Both Seven and Tom have to deal with the fact that they’ve spent years with a crew who respect and trust them, but now have to face an outside world that doesn’t. After all, Seven is not only a former Borg drone, but also one of only a handful that didn’t join the Caeliar gestalt; while Tom is still regarded as rebellious (and only kept in Starfleet due to Janeway’s influence) as well as reckless because of his handling of the situation with his daughter in Unworthy. Described broadly, this idea of characters redeeming themselves, and being better than they appear is a common plot for Star Trek. But it is also one that works well, especially because of the complex interactions with the secondary characters (The Doctor, Axum, Samantha Wildman, Icheb and Admiral Akaar all feature to varying degrees). The Full Circle fleet storyline also follows another typical plot found in Star Trek: how the Federation deals with large powers that don’t quite match their ideals, and specifically what happens if they try to subject a member of the Federation to their own idea of justice. Unfortunately, the ultimate resolution to this ends up a bit weak, but as consolation it leaves the door open for more in the future. Constantly switching between the two plots is a little frustrating at times, but only because each one is so engrossing. During it all, the new characters in the Full Circle fleet get enough time to get some depth and feel important (and in some cases like Liam O’Donnell, to stop feeling like one-dimensional caricatures). This didn’t blow me away like some have (like DTI: Watching the Clock or the Mirror Universe series), but it’s better than most other recent novels and is definitely the best of the Voyager relaunch and worth reading if you have any interest in Voyager. Although you should probably start at Full Circle and read them all. Since I’ve now reached the point that I’m reading new Star Trek books as fast as they are being made, as well as slowly picking up older ones here and there, I figured I should start sharing the knowledge I have gained. The first review I wrote is now available here (I actually wrote this several years ago – I just updated the formatting) and I intend to write more. This was originally posted on 2011-05-20 at 10:22, but has been reposted because of cool layout updates. Also, as part of my plan to post more reviews of Star Trek novels. I recently started buying and reading a lot of Kindle Star Trek novels (on my Nexus One Nexus 4 incidentally – I don’t have a Kindle). Although a part of me is mildly worried and annoyed at the closed DRM’d nature of Kindle eBooks (and often the price) the ease and convenience has won out. Star Trek novels have a improved a lot since I read them previously many years ago. Not necessarily the stories themselves but that there seems to a serious concerted effort to maintain continuity between, but without requiring too much knowledge of other books to read any given book (although there are more series now which obviously do require you to read them all for it to make sense). With that in mind, before reading DTI: Watching the Clock you should definitely read the Destiny series and possibly the Typhon Pact series and the Titan series. Everything you need to know about them is explained in the book but it does spoil them a little if you do intend to read them at some point. If you ever thought time travel in Star Trek didn’t make sense (and would like it to) then this book is for you. Truly awesome. Time travel in Star Trek has always been a slightly problematic topic. Featured as the primary plot device in many episodes (and several movies), it was always handled differently and never followed any discernible rules. This book tries to straighten this all out (or as Douglas Adams once said make it, at least, firmly crooked) and on the whole, succeeds. The book feels like a collection of short stories about time travel, tied together with an over-reaching story arc (complete with seemingly insignificant events in one “story” that become important later). Many of them are about how the DTI dealt with the aftermath of different time travel events in the show. In fact practically every Star Trek episode that dealt with time travel is mentioned (except for new Star Trek movie) and explained to some extent. A couple of the big ones (specifically Star Trek: First Contact, the Temporal Cold War and the whole of Voyager) are more central to the story. Aside from the technical aspects of time travel, the book also devotes time to expanding the main characters, Dulmur* and Lucsly, who were introduced to us in the Deep Space 9 episode, “Trials and Tribulations”. 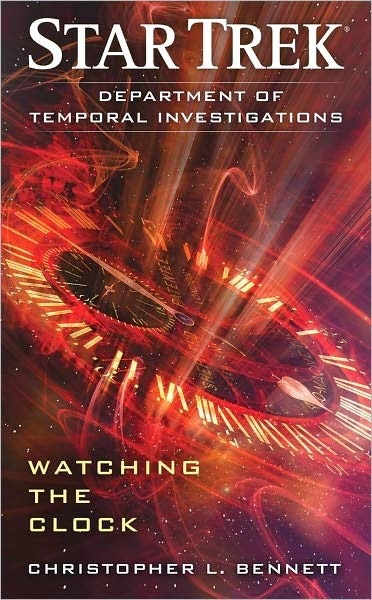 As the blurb says: “There’s likely no more of a thankless job in the Federation than temporal investigation”. Considering how interesting the time travel elements are, I expected to find these parts more boring than I did. In fact after seeing how they deal with some of the Starfleet officers (and more specifically how the Starfleet officers deal with them) I thought about Sisko’s reaction to them and found him downright annoying. So the bottom line is, the only reason I can think for a Star Trek fan not to read this would be that you want to read some of prerequisite books first (Destiny, Typhon Pact, Titan). *Dulmur or Dulmer? I always thought Dulmer since their names were supposed to be anagrams of Mulder and Scully. The author however uses Dulmur consistently and there is a point in the story where the spelling confusion is referenced explicitly.